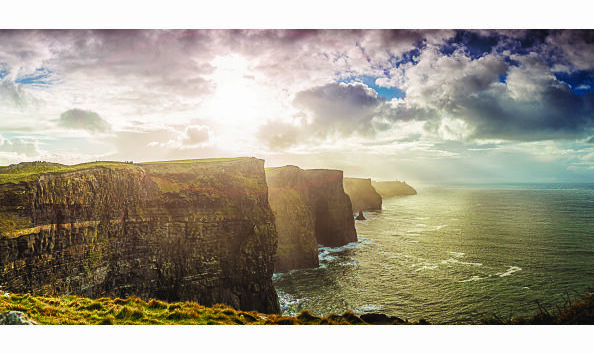 Bid today on this unforgettable 12-day expedition cruise for two to Ireland and support the work of the Bruce Trail Conservancy (BTC). 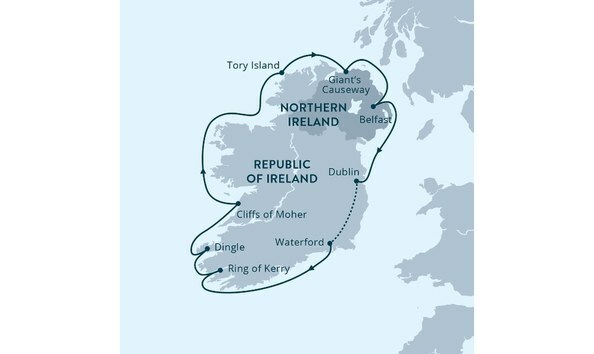 This twelve-day voyage aboard the Ocean Endeavour shows Ireland in its best light. This island nation has always embraced the ocean. From cosmopolitan Dublin to coastal Ulster, there’s so much to see by sea. Irish culture is vibrant and welcoming. Visit quaint villages, harbour towns, and modern cities. Meet the people, hear the stories—and tap your toes to the music! Explore another side of Ireland aboard our Zodiacs. Cruise rugged coastlines. Find abundant seabirds, and keep your eyes peeled for whales. Ireland is a photographer’s paradise, a traveller’s dream; we will show you it all—by sea. Visit Irelands gems: Giant's Causeway, Cliffs of Moher, the Ring of Kerry and more. Tour the Dingle Peninsula, described by National Geographic as the most beautiful place on earth. Sail past the picturesque Skellig Islands, featured in The Last Jedi. Explore rolling countryside, charming towns, and scenic islands. Spot rare seabirds and marine mammals along Ireland’s rugged coasts. Learn Irish history, archaeology, and culture from enthusiastic experts. This trip has been generously donated by Adventure Canada and 100% of the proceeds of this auction go to the Bruce Trail Conservancy (BTC). Items are purchases and successful bidders will not receive a charitable tax receipt from the Bruce Trail Conservancy. As this is a charity auction and this item was donated, there is no sales tax on your purchase. "Popcorn bidding" is in place and may extend the closing time. If a bid is placed during the last 5 minutes of the auction, the closing time will be automatically extended for an additional 5 minutes from the time the last bid was placed. The item will close once all bidding activity has stopped. This "Popcorn bidding" style is in place to give all who were outbid a chance to rebid. Each bid you make is a binding contract to buy the item if you win. Make sure that you read the listing description before you bid. No officer, director, employee or staff member of the Bruce Trail Conservancy nor any member of the Bruce Trail Conservancy or any person who is related by family of a member of the Bruce Trail Conservancy shall bid on an item in the Auction with the intent to increase its price or desirability artificially. At the close of the auction, the winning bidder will be sent an invoice by email from our auction platform, Charity Auctions Today, and the winning bid amount will be charged to the credit card provided at the time the bidder made his/her first bid. The Bruce Trail Conservancy will connect the winning bidder with Adventure Canada to who will finalize booking of the expedition cruise with the winning bidder. The booking will not occur until payment of the winning bid has been received by the Bruce Trail Conservancy. All items are final sale; no alternatives, exchanges or refunds provided. The auction item must be accepted as awarded. The winner must be of the age of majority in their respective province of residence. The winner is responsible for obtaining all required travel necessary documentation, if any required. The winner must produce proof of adequate travel insurance as defined by the tour operator as required. By entering this auction, each bidder absolves the Bruce Trail Conservancy and their respective officers, The Bruce Trail Conservancy Board of Directors, employees and their respective advertising and promotional agencies, agents, representatives, and contractors from any and all liability for any harm he/she may suffer as a result of participation in the auction. The Bruce Trail Conservancy is not liable for any bids which are lost, or late for any reason whatsoever or for: faulty computer components, software or links; the loss or non-existence of communications capability; faulty, incomplete, incomprehensible, or erased computer or network transmissions; any problems or technical malfunction of any telephone network or lines, computer on-line systems, servers, access providers, facilities or computer equipment or software; any failure of (or delay in) any e-mail or other electronic transmission to be received or sent by bidder that delay entry, result in a null bid or otherwise render a bidder ineligible for this auction; or any combination of the foregoing. The Bruce Trail Conservancy reserves the right to suspend, modify or terminate this auction, including, without limitation, the selection of the winning bid, at its sole discretion, for any reason, including, without limitation, in the event a computer virus or bug, unauthorized human intervention, or any other occurrence beyond its control corrupts or adversely affects the administration, security, impartiality, or intended operation of this auction. This Auction is subject to all applicable federal, provincial, and municipal laws and regulations.